As the use and cultivation of cannabis or marijuana for medicinal purposes becomes more acceptable, many users are exploring ways to access the drug. Many medical organizations are offering their support for the use of medical marijuana when prescribed by doctors. There are many places where medical marijuana is legal. If you have obtained a prescription for medical marijuana and you are shopping for the best source, you need to find out if growing the plant is legal in your region. Following are some tips to help you when you decide to grow medical marijuana. The first thing you need to do is to get a prescription from your doctor. This will depend on the condition that you are suffering from but marijuana has proven to be beneficial for a wide range of medical issues. If your primary physician is not willing to give you a prescription for medical marijuana, the good news is that it is not difficult to get an alternative opinion. You can find a doctor willing to give you the prescription that you need. When choosing the seeds, you need to consider the medical condition that you are addressing. There are different strains of the plant that work for treating specific conditions. The Indica strain, for example, is a relaxant and it is typically used for relieving symptoms of muscle spasms, multiple sclerosis, tremors, pain management and mobility issues. The Sativa strain is more effective as a stimulant and it is appropriate for pain, migraines, appetite stimulation and nausea. You can also get hybrids that will allow you to get the best of both species. You need to find the best place for the plants to thrive. Look for a place that has adequate light, whether it is outdoors or indoors in a greenhouse. The plants need at least six hours of sunlight. If your garden is indoors, make sure that all the plants’ receive enough light. You can use a high-pressure sodium bulb during the initial growth stages. You need to know that the plants require different light cycle duration during the vegetation and flowering stages. You need to germinate the seeds and there are several ways to do this. You can drop the seeds in a cup full of warm water and store them in a dark space for one to three days. When you notice a white root emerging from the seed, the seed is ready for planting. You can also use the wet paper towel method. Place the seeds on the towel before folding and storing them for one to three days in a dark place. You can also use the grodan cudes method where you simply plant the seeds without germinating them first. You need to determine if you want to grow the plants naturally or organically, or if you prefer to use chemical fertilizers. The best option is the natural growth especially if you plan to smoke the plant. Using natural ingredients is a healthier option as the chemicals in the fertilizer tend to give the plant an undesirable taste. Use a small pot to plant the seed in the starter soil. Sprouting the seeds in unfertilized or starter soil will help the young plant. Remember that the seeds have their own supply of nutrients. You need to water the soil well before dropping the seeds. Make a half-inch hole in the soil before placing the seed inside with the root tip facing up. The root will search out the heat coming from the soil surface before coming close and turning downward. This will pull the leaves that are opening above the surface. If the root points downward, it will go down in search for the soil surface before turning to go up. This essentially means that the plant will run out of energy before finding the surface. You need to ensure that you keep the soil moist before the young plant appears. Leave the plant in the pot for two weeks. You need to provide at least 18 to 24 hours of adequate light each day. If you are using artificial lighting, go for fluorescent lights and avoid using powerful lights as grow lights. Make sure that you keep the plant from getting too cold or too hot. 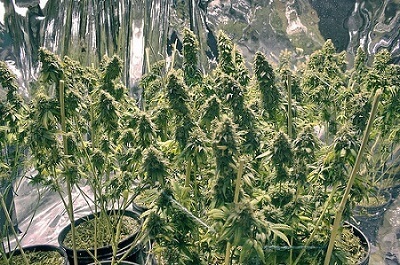 Provide plenty of fresh, moving air for the plants. You can achieve this using a small fan to provide the wind motion. This will help to strengthen the plants fibers, which gives them a better chance for survival. Prepare the soil in the area where you want to grow the plants. Follow instructions for using fertilizers to avoid killing the plant. Be very careful when transferring the young plant from the small pot and gently place it in the hole you have prepared. Remember to water the soil without overdoing it. Watch the plant as it grows to make sure the growth conditions are perfect. You can induce flowering if you wish to and make sure that you identify whether the plant is male or female.